George Washington University President Thomas LeBlanc, who often refers to himself as the “accidental president,” never took a course in leadership. Rather, he studies great leaders in history by reading biographies of historic figures such as Simón Bolívar and Alexander Hamilton. Dr. LeBlanc said he tries to model his leadership style after some of those people. In higher education, Dr. LeBlanc said, there are five things leaders need to exhibit to be successful: integrity, empathy, transparency, being consultative and a willingness to make decisions. “If you don't have empathy, you won't be able to connect with the students, won't be able to connect with the faculty and won't be able to connect with certain kinds of disciplines,” Dr. LeBlanc said. Dr. LeBlanc discussed his perspectives on Monday night in the Funger Hall first-floor auditorium during a new interview series from the School of Business. “George Talks Business” will bring regularly-scheduled 30-minute interviews with respected thought leaders in multiple fields. GWSB Dean Anuj Mehrotra moderated Monday’s interview, which was also live-streamed on the school’s Facebook page and YouTube channel. “Our goal is to bring you conversations with interesting people on interesting timely topics, including technology, ethics, global perspective and leadership,” Dr. Mehrotra said. 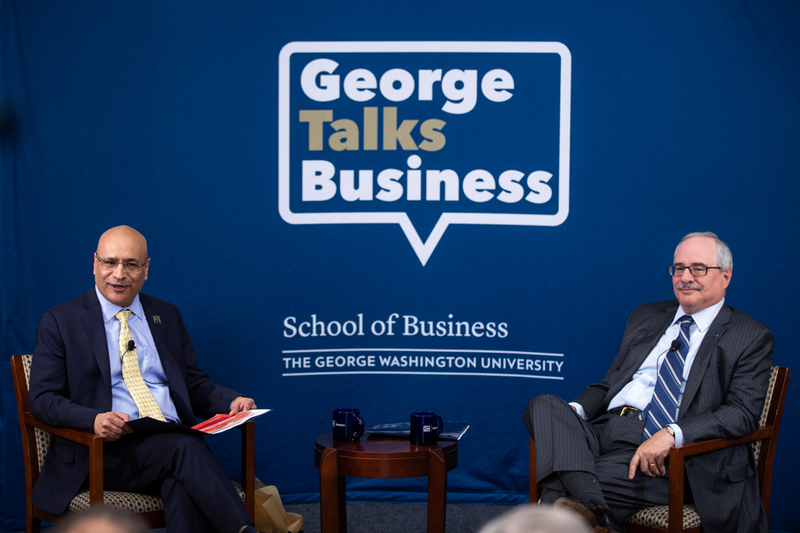 GWSB Dean Anuj Mehrotra (l) moderated the inaugural George Talks Business event with President Thomas LeBlanc (r). GW already is leading in many critical trends seen in higher education, Dr. LeBlanc said, such as online education and graduate-level programs, which the university will continue to grow. The growing role of quantitative analysis and technology in society influenced a new university-wide initiative around data science and programming that will involve the introduction of more data science courses, he said. As the demand for the modularization of education increases, Dr. LeBlanc said, institutions must offer more certificates to allow students at all levels to learn what they need to learn when they need to learn and utilize those skills. Dr. LeBlanc also encouraged alumni participation in the student experience. He said alumni can always help by recommending great students to apply, helping GW students get jobs at their organizations and speaking highly of the university. The university will continue to leverage its location in attracting students and faculty who are interested in the aspects that make GW special. “[Our students] come here for the internship opportunities that are present here in the city, unique educational opportunities and to be a part of the dynamic of being in the capital of this country,” Dr. LeBlanc said. “The GW student is really unique. They came here to change the world, and you can see it in the things they study, the internships they take on." Anuj Mehrotra says GWSB programming will center around student engagement and will be market driven.